Taking the radio station as its starting point, the festival opens on the « post – radiophonic »: an attempt at apprehending new kinds of expressions in sound and radio-art, which are propagating beyond a desire for control, propaganda or discourse. This is a radio inventing itself; in which the three genres of radiophonic art – fiction, documentary, sound art – are approached in their pure or porous forms, through the theme of contamination. 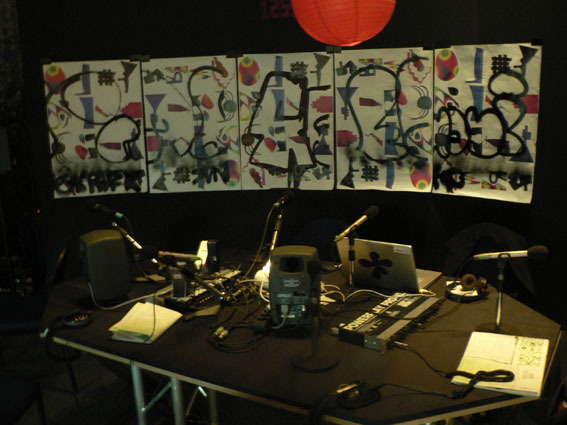 The Radiophonic Festival 2007 offers a laboratory space for radio-artists, those who capture sound, broadcast it on the airwaves as much as for artists of all disciplines, poets, animators, activists, scientists and the amateurs. If the specificity of sound is to propagate freely, it sometimes does this, despite ourselves. At Radiophonic, both hertzian and Web radio will be the transmitting medium of sonorous viruses, which all kinds of creation, from literature to music, theatre, dance or the visual arts appropriate in order to parasite them and transform them. | 403 forbidden | on this server.